The Pentecost HX-1 Hoppi-Copter, a functional backpack helicopter. 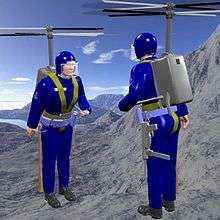 A backpack helicopter is a helicopter motor and rotor and controls assembly that can be strapped to a person's back, so he can walk about on the ground wearing it, and can use it to fly. It uses a harness like a parachute harness and should have a strap between the legs (so the pilot does not fall out of the harness during flight). Some designs may use a ducted fan design to increase upward thrust. Several inventors have tried to make backpack helicopters, with mixed results. First, there is no tail rotor, and the main rotors are contra-rotating. Yaw is controlled by fine adjustment of a differential gear in the rotor drive transmission. When one rotor is adjusted to spin slightly faster than the other, it induces yaw (turning motion). Second, the rotors are fixed pitch, which assists with simplicity; this means, however, that in the event of engine failure autorotation is impossible. Usually, a ballistic parachute would be incorporated for safety. An edition of Popular Science magazine in 1969 featured a backpack helicopter that used small jet engines in a tip jet configuration instead of contra-rotating rotors. This design could function in autorotation. Related are devices like a backpack helicopter which also include a seat and leg supports, which are small, open-topped helicopters. In theory, a helicopter would be more efficient than a rocket-powered jetpack, possessing a greater specific impulse, and being more suited to hovering, due to the lower velocities of the propelled gases. The Heliofly was a make which was designed in Germany in 1941 onwards. The Pentecost HX-1 Hoppi-Copter was developed by Horace T. Pentecost, an independent inventor and demonstrated to the military in 1945. The Libelula ("dragonfly") from Tecnologia Aeroespacial Mexicana has a 2-bladed rotor driven by a small rocket motor at the end of each rotor blade. The company also manufactures a jetpack. SoloTrek XFV (Exo-skeletal Flying Vehicle). Vortech designed various models which have seats. They formerly also made a pure backpack model with two very long rotor blades driven by a little propane-powered jet motor at the end of each blade. Backpack helicopters are a popular gadget in fiction. The SoloTrek XFV has appeared in spy films, such as the 2003 film Agent Cody Banks. In real life, backpack helicopters are flown with the pilot's body vertical, but some appear in fiction (for example, in Dan Dare comics) that are flown with the pilot's body horizontal. Several action figures come equipped with backpack helicopters. Such an accessory was released as part of the G.I. Joe toyline for any figure to use. The Annihilator figure had a helicopter back-pack as part of its accessories. Another vertical example is the Turbo-Copter unit for the popular Action Man toy figure. In the 2009 video game Scribblenauts a backpack helicopter can be summoned using the phrase "helibackpack"
In the 1973 Woody Allen film Sleeper, Allen's character Miles Monroe tries to escape from police whilst using a largely ineffective backpack helicopter. He couldn't rise more than a few feet off the ground, nor for longer than several seconds, despite much arm-flapping. Hiller ROE-1 / YROE-1 "Rotorcycle"
↑ "Heliofly". Geocities.com. Archived from the original on 2009-10-22. Retrieved 2009-07-26. ↑ "Pima Air Museum - Pentecost Hoppicopter". Pimaair.org. Retrieved 2013-06-18. ↑ "RHYME Strap-on Helicopter". Web.archive.org. Archived from the original on March 28, 2009. Retrieved 2013-06-18. ↑ Juan Manuel Lozano Gallegos. "Backpack helicopter from Tecnología Aeroespacial Mexicana". Tecaeromex.com. Retrieved 2013-06-18. ↑ Juan Manuel Lozano Gallegos (1954-05-13). "Rocket Helicopter Tecnología Aeroespacial Mexicana". Tecaeromex.com. Retrieved 2013-06-18. ↑ "Aircraft and Jet books and videos". Vortechonline.com. Archived from the original on 27 June 2009. Retrieved 2009-07-26. ↑ Archived December 17, 2005, at the Wayback Machine. ↑ MyFreeTemplates.com (2003-11-05). "PAV Springtail EFV". Trekaero.com. Archived from the original on 2008-05-11. Retrieved 2009-07-26. ↑ Joshua (2004-02-29). "Scribblenautics: Tons of new videos and a new trailer...Part 1". Scribblenautics.blogspot.com. Retrieved 2009-07-26.